A popular saying among the Dong people in Guizhou Province in southern China has it that ‘rice nourishes the body and songs nourish the soul’. 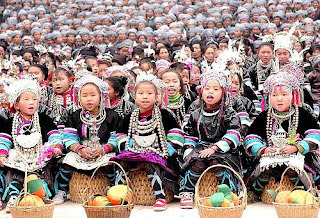 Their tradition of passing on culture and knowledge in music is exemplified in the Grand Song of the Dong ethnic group, multi-part singing performed without instrumental accompaniment or a leader. The repertoire includes a range of genres such as ballads, children’s songs, songs of greeting and imitative songs that test performers’ virtuosity at mimicking the sounds of animals. Taught by masters to choirs of disciples, Grand Songs are performed formally in the drum-tower, the landmark venue for rituals, entertainment and meetings in a Dong village, or more spontaneously in homes or public places. They constitute a Dong encyclopaedia, narrating the people’s history, extolling their belief in the unity of humans and nature, preserving scientific knowledge, expressing feelings of romantic love, and promoting moral values such as respect for one’s elders and neighbours. Grand Song is performed widely today, with each village boasting various choirs divided by age and sometimes gender. 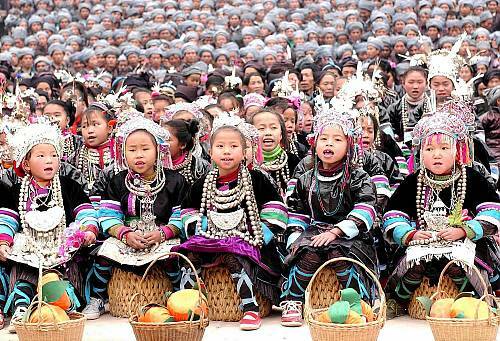 In addition to disseminating their lifestyle and wisdom, it remains a crucial symbol of Dong ethnic identity and cultural heritage.